This is usually thought of as the most southerly of the big and important passes in the alps. The two special things about this pass are: One: the amazing number of regular switchbacks, stacked up on top of one another as part of an old unpaved road on the French side. Two: the historical importance of this crossing, resulting in a immensely fortified ridgeline. The ruins of these fortifications remain. In a way this is like a visit in a museum, but without the crowds or fees that are often connected with such a visit. From South. The profile starts with a big old highway bridge in Ventimiglia,There are probably plenty of ways to go around it, but why bother ? The highway bridge works just fine, and it is easy to find on the first try by following simple road signs. Once past the bridge, S20 enters the canyon of the river Roya. 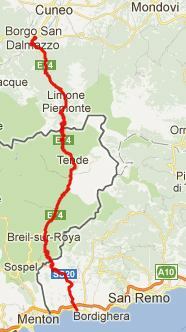 The route follows S20 and the river all the way to the town Tende. But back to the start: After a km inside the canyon, there are two sections of long tunnels. I think the first one is half a km or a bit longer. But it doesn't really matter, because you only glimpse daylight briefly, before it enters the next one, and then the next, and so on. There were so many tunnels, I lost count. They all had plenty of space for a bicycle, were fairly well lit, and I had no problems with the traffic. Meanwhile the road crosses into France. Glimpses of hilltowns far above the canyon make this ride as fascinating as many of the adjacent southern canyons: the towns Fanghetto, Saorge, la Brigue, and maybe best of all, Tende itself. Tende has all the infrastructure for a good base location to explore the surrounding mountains on a mountain bike. A sports shop, a municipal campground, that also rents reasonable simple rooms, 2 medium to small food stores (including 1 Spar shop), and a tourist department. Even if it's closed, there is a map displayed north east of the center of town, that shows the principal mountain biking routes. Just about all of them involve Col de Tende in some way. But the nicest thing about Tende is the old medieval town itself. You really don't need a day of rain, and an excuse not to bicycle, and to explore the town instead. My favorite spot is the cemetery, also the highest point of the town. Most descriptions of the pass start in Tende. Past the town the road gradually gets steeper. Even before the old pass road branches off the newer tunnel route, I count 9 switchbacks. Apparently there is also another secondary road that bypasses some of these lower switchbacks. It is signed as "no car traffic - sauf souverains (local traffic only)". At this point you can already see the goal, the old central military fort above, and in the morning light it doesn't really look that high. Just before the tunnel a hard left takes you onto the old pass road, and then the switchbacks really start. There are 48 of them, regularly spaced on a narrow road, like a staircase. A few of the switchbacks are numbered. The dirt road does not start until switchback 28 or a little above. Compared with the other military roads, that leave from the pass (now MTB trails) this dirt road is in really good condition. I met a cycling couple with fully loaded regular touring bikes on top. They made it from Tende to the pass by about lunch time. The connecting ramps tend to get longer and longer, making you think that you have made more progress than is actually the case. By the time you climb above treeline the ramps are many times as long, as they were in the beginning of the climb. There are forts along the ridge line in both directions. The Central main military fort is a little distance to the east. It's easy enough to just walk over to it. It would be a shame to miss it. On a mountain bike it's just a roll away. From North. (described downwards). I had the feeling I missed the south side as soon as I started rolling down the north side. All the medieval hill architecture is gone, suddenly replaced by ski hotels, pretty much all closed when I was there. Mountain views are also not as good, at least in morning light. There is also a short unpaved section, a little distance below the top on this side. Past Limone the route converges with the traffic from the tunnel, and there are a few short sections that could be described as unpleasant due to traffic and an abrupt road edge. But it is really no problem, at least in a downward direction. - The tunnel is open alternately in each direction. So the traffic exits the tunnel bunched up into convoys, then a long time - nothing. Quite far down the valley, somewhere around Robilante a bike path starts. But all the racers still seem to use the road. Unlike the French side, there are plenty of industry and shops on this side, and this gets heavier the closer you get to Cuneo. Now there is no problem to find the foods you've been doing without on the medieval French side. Ancient to Medieval times: You would suspect that people have been following up the canyon of the river Roya for a long time, and that people have been wandering up into the mountains above Tende for nearly just as long. It turns out that a Greek geographer by the name of Str_abo already mentioned this pass. He was then quoted by Roman authors Varro and Servius. It is widely speculated that the Hannibal with his elephants ascended the (now) French side of the pass, when he started out on the Iberian peninsula to invade the Roman empire from the south. A mention of a highway between Ventimiglia and Borgo San Dalmazzo, ie the route of the profile, goes back to 1178. It was used as a salt trading route into the alps. Tende provided surveillance and maintenance for the road. During the middle ages the road was reinforced and the entire Roya valley prospered from this work, controlled by the town of Tende. Napoleon: During the mid 18th century, this was one of many pass roads that was improved by Napoleon. For the sake of easier troop movements, the road bed became better engineered, the slope was made gentler, the surface harder and more even. World War 1 and 2: The remnants of the fortifications that we see to today on the ridge line were built in 1877 trough 1880 by the Italian Piedmont, then fortified into a series of six buildings, in order to be of advantage in conflicts with the area to the south. The pass played a big role in the various complicated twists and and turns, resulting in wars that Europe fought with itself. The last one of these is WW2, when France captured the pass, along with the already built tunnel. With the "Treaty of "Paris" following WW2, de Gaulle insisted that the Italian French border runs well north of the ridge line, thus giving France the entire ridgeline with its forts and fortifications. Modern Roads: In 1882 a 3182m long tunnel was constructed at 1750 m altitude. It was the first long tunnel under a major alpine pass, and followed by a railway tunnel in 1898. A day on a tour: (<Col de Castillon|Col de Larche>) Tende > Col de Tende > Limone > Borge S. Dalmazzo > up the Itinerario Valle Stura signed bike route > Demonte: 53.8miles with 5610ft of climbing in 5:22hrs (m4:12.6.1). Notes: includes about 7 miles of exploring the area immediately around Demonte.